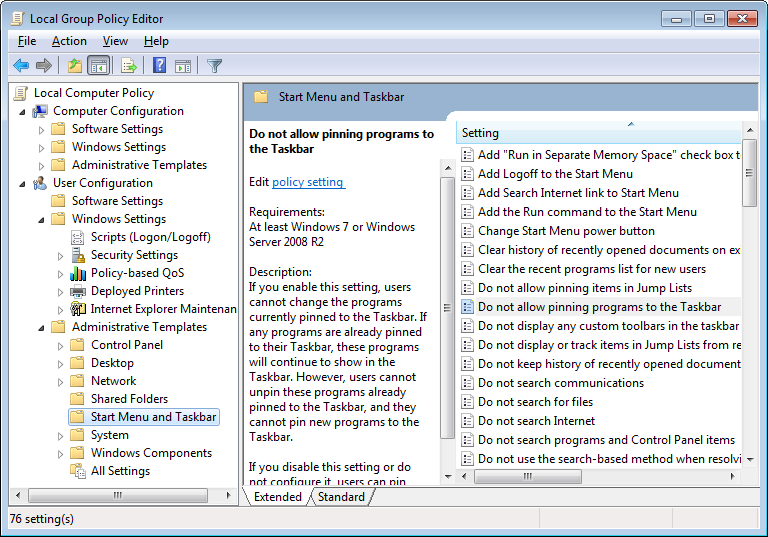 When I right click programs in the taskbar I have the option to "pin them to the tasbar". Is it possible to remove this option from the right click menu? This isn't a guide, but it's a question that was posted asking the same question you're asking. Also, the discussion is a little bit hard for me to follow because it's a thread but the responses to previous posts begin immediately following the last character of the post they're responding to. To skip to down to the part that might work for some of your programs, perform a Ctrl+F search for "got". This is the first word of the post that suggests a possible solution for some programs that might allow it. Read the replies that this post received. You might see if the option used in the tutorial below to remove the "Pin to Taskbar" item from all context menus may work for you for this. Never mind. This doesn't remove the "Pin this program to taskbar" option from the Jump List for opened program icons on the taskbar. He's talking about "Pin this program to taskbar" when right-clicking an open program on the Taskbar. This option has caused me to accidentally pin a program or two to the Taskbar, and I admit that I wished it wasn't there for those times. However, over time, I have adjusted and I no longer accidentally click it - but I also live at my computer, so that's a large amount of time that I spent getting used to it so much that it's no longer a problem. I use this feature allot . Hi Gary, I appreciate that but I don't use it at all as I use the quick launch bar instead of pinning, and have accidently pinned programs a few times now. Why would you want to remove it ? My favorite advantage of pinned items is being able to open them using the following keyboard shortcuts: Windows Key + 1, Windows Key + 2, Windows Key +3, etc. etc. all the way through Windows Key + 9 and finally Windows Key + 0. These correspond to each pinned item starting from the left, and Windows Key + 0 opens the 10th pinned item from the left. This turns the top row of numbers into buttons that correspond to each of your pinned items, just as long as you press one of them while holding down the Windows Key! Not only that, but there are other advantages to pinned items that I'd like you to discover on your own (it's more fun that way). The Quick Launch toolbar is really only useful for getting things stuck to the Taskbar that can't be pinned (since you can put pretty much anything in the Quick Launch folder). Seriously: don't shoot yourself in the foot by never taking advantage of being able to pin items to the Taskbar. It's not as lame as pinning items to the Start Menu which is an old trick. Pinning items to the Taskbar means you not only get these keyboard shortcuts, but you get other nice advantages. Experiment. ...and here I thought that you had everything pinned to the Taskbar that you wanted pinned and now this option was just getting in your way from time to time. Can't "Hover" Taskbar Icons with multiple windows, have to click! How to pin a prgm from "removable media" to TaskBar/Start menu?